The flat coastal area of today’s province of Grosseto was the swampland of Tuscany that for centuries posed the greatest difficulties from the viewpoint of environmental reclamation. The exploitation policies of the Medici age aimed at boosting agriculture and pasturage in the area, though the presence of the large Castiglione Lake, which in the 16th century had an extension of approximately 50 km 2 , strongly limited development. At the same time, however, fish farming guaranteed the government one of the most substantial incomes of its entire landed patrimony. The Reserve of Diaccio Botrona houses a rare and important ecosystem that contains an incredible variety of micro-organisms, both vegetable and animal, offering a real “genetic bank” that contributes enormously to the upkeep of the biodiversity of the area. The vegetation is characterised by the crops of glasswort on the west side of the Diaccia and the lemon-orchard, and more typically of the marshy areas, the reed thickets, bulrushes and sedge. Here there are also fifteen or so species of wild orchids, some of which are of particular interest for their beauty and rarity. Of the vast forest that once covered a large part of the Maremman plain, there now remain just a few small areas consisting of ash, elm and tamerisk. The avifauna represents the most interesting and most spectacular feature of the Reserve. In fact about 200 species have been counted and registered that come and go in the course of a year, of which about 80 nesting. Among the most important are the marsh harrier, hen harrier, white heron, osprey, kite, honey buzzard, curlew, little egret, crested heron, godwit, red heron, bittern, European roller, and Great spotted cuckoo. Mammals inhabiting the Diaccia reserve include fox, hedgehog, porcupine, badger, hare and coypu or nutria. There are also numerous reptiles such as the sea turtle, collared snake, coluber (elaphe quatorlineata), Aesculapian snake, common lizard, slow-worm, green lizard, seps, Hermann tortoise and the gecko. The waters are inhabited by crustaceans, annelids, arachnids and insects. The Casa Rossa Ximenes (The Red House of Ximenes): named after the architect Leonardo Ximenes, who was responsible for the most important projects for reclaiming the area. This impressive structure, also known as Casa Rossa (red house), was built around 1765 on a project by the Jesuit Leonardo Ximenes, instructed by Grand Duke Peter Leopold of Lorraine to attend to the reclamation project of the Maremma area of the province of Grosseto. Ximenes’ projects marked one of the most important phases in the works of reclamation. The scientist argued that it was not necessary to completely drain the lake of Castiglione, as had been previously attempted, but that its regimen had to be properly controlled so as to avoid stagnation, allowing it to continue to be an important source of income and occupation (fishing, hunting, transport, utilisation of swamp vegetation). When and how to visit it March and September are, no doubt, the best months to visit not only the Diaccia but all wet areas. At the beginning of autumn, you can watch the gradual arrival of the migratory birds and of the ones which will stay in the area just for a few days' rest, before flying off again to reach the wintering lands farther south. October is the month when the landscape is the most charming, because the first rainfalls and signs of the coming Sunset in Diaccia Botrona winter tinge the marsh vegetation with extraordinary colours, such as the red of the saltwort and the violet of the limonium (statice) and aster flowers. In winter months the marsh teems with birds, a real paradise for "birdwatchers", who can, through good binoculars, observe them eating, making "their toilet", resting or trying to fly away to escape from a predator. At springtime the new migratory phase begins: the limicolous birds, most of the anatidae and the great white herons fly off and other species take their place. Everywhere the marsh resounds with the songs of the various reedbirds, river larks and nightingales trying to allure a partner or delimiting their own reproduction territory. In this period visitors must be very careful not to disturb the animals during their delicate reproductive phase; that's why they are advised to stop at the borders of the area without getting into it. Summer is definitely the least suitable period to visit the Diaccia Botrona: scorching heat, sultriness, dryness and mosquitos are pitilessly waiting for anyone who dare venture into the area. Casa Rossa Ximenes opening hours: from September to May, Thursdays, Fridays, Saturdays and Sundays: 1.00 p.m.-7.00 p.m. On June, July an August, Tuesday, Wednesday, Thursdays, Fridays, Saturdays and Sundays: 4.00 p.m.-10.00 p.m. Excursion on boat starting at 5.00 p.m.
How to reach the Diaccia Botrona After arriving at Castiglione along the provincial road n.3, of the Padule, or the main road n. 322, of the Collacchie, you must reach the Giorgini bridge over the river Bruna. Here you must turn left (right if you're coming from Grosseto) and drive along the road running parallel to the river, until you reach the parking area facing the Casa Rossa (Ximenes House). From the bridge of the old building you can admire a charming view of the whole wet area. Ruins of the Medioeval monastery "La Badiola" placed on the Isola Clodia You can also reach the Diaccia Botrona from the west side: take the provincial road n.3 of the Padule towards Grosseto; at about seven Km from Castiglione you'll see a very small group of buildings called Ponti di Badia; here you must turn right, cross the bridge and drive along the non asphalted road until you reach the marshy area of the Diaccia Botrona. Leave your car and walk along the main path as far as Clodia Island; if, on the contrary, you turn right, you can walk along the bank of the Collecting Canal that runs along the edge of the wide wet area on the western side. Also in Castiglione della Pescaia, 1 km inland, the sluice on the San Leopoldo canal is one of the barrage works conceived to channel and discharge the waters of the large Castiglione Lake into the sea. Grand Duke Ferdinando I de’ Medici attended to the realisation of many hydraulic works, in 1592 instituting the Canals Office of Grosseto, which was the most important measure adopted to remedy the area’s hydraulic precariousness. Indeed, for the first time, the ruler appointed a local decentralised authority to coordinate, control and define reclamation initiatives in a province that was scarcely populated and perpetually devastated by the incursions of wild livestock that caused the systematic destruction of any and all hydraulic constructions. During the Lorraine Regency, a team of engineers launched the integral reclamation plan of Maremma, which was subsequently supported by Grand Duke Peter Leopold. With its realisation entrusted to Leonardo Ximenes who described its features in his famous work, Della Fisica riduzione della Maremma senese, this project abandoned the previously attempted idea of filling Castiglione Lake, and instead aimed at exploiting it for production by means of a systematic and rational regulation of its waters. "Refreshment" canals were dug in order to allow the regulated introduction of waters from the Ombrone River into the lake, so as to avoid stagnation. Furthermore, in order to control and facilitate the outflow of lake waters towards the sea, the Floodgates Building was constructed on a project by Ximenes, and the Canale Reale or Maestro was excavated nearby. Pietro Ferroni, who succeeded Ximenes in 1781, retrieved the old project to drain Castiglione Lake and carried out its partial filling. The Lake’s definitive filling was carried through in the course of the first half of the 19th century, thanks to the study by Vittorio Fossombroni, which implemented the most impressive reclamation measure of Maremma in the provinces of Pisa and Grosseto. Launched with a decree by Grand Duke Leopold II on November 27, 1828 and set forth by Fossombroni in his famous, Memoria sulla Grossetana [Memorial on the Grosseto Territory], the project was carried out under the technical direction of Alessandro Manetti. The lake water was collected in five reclamation basins, and then emptied into the sea by means of three specially excavated effluents equipped with sluice-gates: the Bilogio, San Leopoldo (still visible today) and San Rocco. The beds of various canals were dug, little subterranean tanks were built and the tract of the Via Emilia-Aurelia between Cecina and Grosseto was modified: using the most sophisticated technologies and with a considerable outlay of human and economic resources, it was thereby possible to give a decisive turn to disposing of this difficult territory. 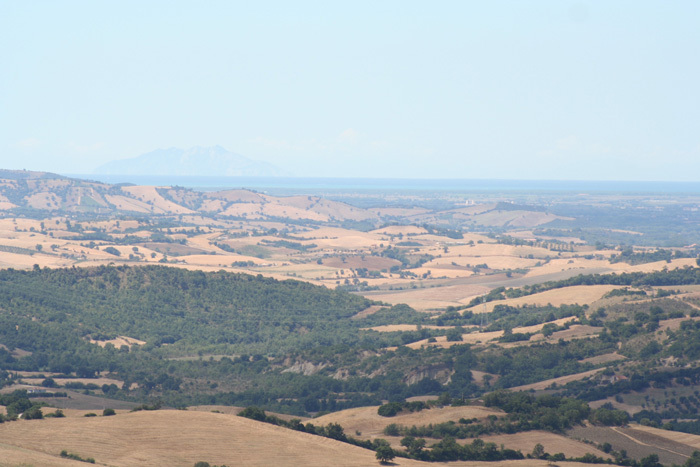 which overlooks on the hills around Scansano, up to the Maremma seashore and Monte Christo.